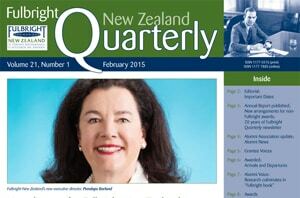 The February 2015 edition of our Fulbright New Zealand Quarterly newsletter is online now! In this issue, read about the appointment of Fulbright New Zealand’s new executive director Penelope Borland, publication of the 2014 Fulbright New Zealand Annual Report, and 20 years of the Fulbright Quarterly newsletter. 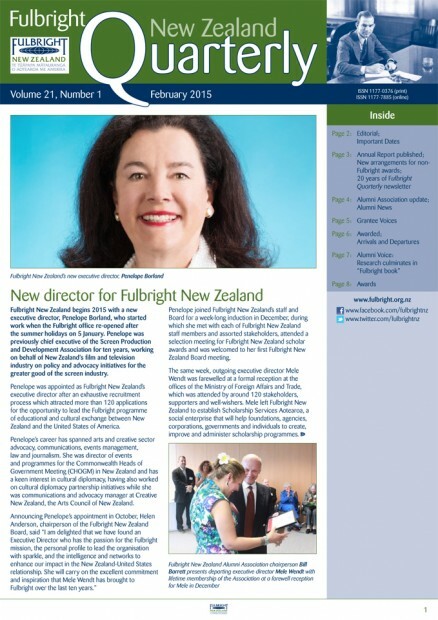 Fulbright graduate students Sunkita Howard and Jamie Branch report on their Fulbright exchanges, Fulbright alumnus Jon Johansson writes about US leadership, and we have the usual news updates from the Fulbright New Zealand office and the Fulbright New Zealand Alumni Association, details of our latest grantees, alumni news in brief, and a full list of available awards.